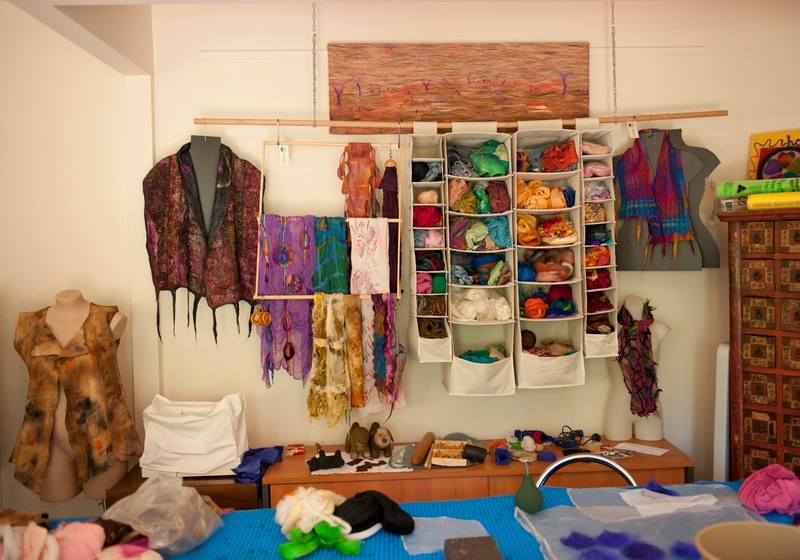 I look forward to sharing my studio space with the visitor and explaining how felt comes together from the raw materials to the finished item. People are curious about how felt is made. 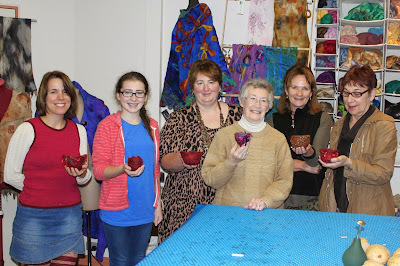 This year I gave a demonstration of Nuno felting, and offered a small workshop experience of felting a vessel. Opening my workshop is an opportunity to step away from what is sometimes a place I hole up in, blinkered, focused on making, a solipsistic experience, albeit as an artist I can say I’m interacting with ideas and materials, as well as suppliers. The mini workshop was nice and cozy – six people had booked in to experience using a potato as a form to felt a small vessel. I had in mind that it was to be a foundation they could build on if they chose to go on with felting. I started one to show how to go about it (how to lay the merino fibres correctly). A couple of visitors came in late (because of a flat tyre), and one of the ladies really wanted to join in, so I relinquished the one I was making and gave her the hands on experience. Felt seems to give people a warm and fuzzy feeling – working with it, looking at it, touching the fibres. It was raining outside and we were snug inside, most of the group coming to terms with handling merino fibres for the first time. 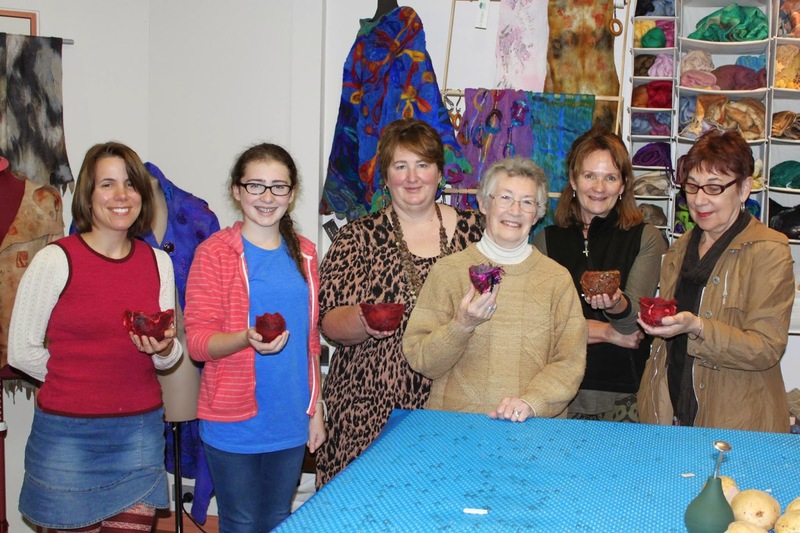 A neighbour who had dropped by to have a peep and was corralled into the workshop experience, suggested that I could hold felting parties for groups of youths. It’s certainly an interesting concept. When visitors provide feedback about my work it is also a buzz. People have made comments like ‘you give felt a good name’ or ‘there’s a lot of felt out there but this here is the good stuff.’ I got to hear about someone’s experience visiting the group exhibition at Burrinja and trying to find my work. Some people go to see specific works and are interested in particular artists. One visitor even indicated that she had Googled me before coming. There are many ways to show or express encouragement and appreciation, not just through purchase. But I have also learned that it’s pleasant to walk away with a small memento, and so this year I had smaller gift items on offer. I also offered a felted prize for signing the visitor’s book (which seems like a chore, particularly if the visitor has been to several studios). My winner had purchased several of my felted cards, which she put together in a photo frame as an ‘artistic landscape’. She told me this after I contacted her about winning my draw of names out of a hat. Each year is a learning curve. The learning I got this year was in relation to ‘presentation’. When the photographer visits a few months before I’ve usually done a bit of tidying up but my studio is set up for working rather than presentation or showcasing my work. It is certainly not clean, tidy and glamorous with all the colour of my works displayed as it appears during the open weekend. The photographer has remarked that my equipment can be boring and untidy (pool bubble, noodle and foot massager and he wanted these things out of the way for a shot) and I understand –printing ink and press, or an easel and paint smeared palette are definitely sexier. But with the bubble wrap and noodle cleared from view what is also lost is the surprise and cleverness of felt making in the ordinary tools that have been adapted for the purpose. And of course – there are my hands too, with cracked and chipped fingernails. I make it all by hand after all. When the photographer visits next year I either need to glam my studio as though it’s for the open days, or make more of the fun videos/photos. Imagine a studio shot with me holding a pool noodle! The latter might depend on (partner) Philip, as he’s the one with the ideas when it comes to the camera. I liked that he videotaped and shared on Facebook how the experience of visiting my studio would be, from coming down The Lane following the trail of balloons he’d tied moments before, to opening the studio door and finding me preparing for my demo. It was as though I had international visitors who all got a chance for peekaboo. And they seemed to enjoy it – people from overseas shared and encouraged those they knew in Melbourne to visit. The virtual experience is not entirely the same (because you haven’t got that body in space experience and you can’t touch or try on) but it whets the visual appetite. My work is so visually tantalizing with all the colours and textures that it draws the visitor in. First reactions are usually with regards to colour – and also touch (superfine merino and silk is unusually soft). I wanted to give the visitor a finding ‘treasure’ experience – with an explosion of colour and textures and at first I considered using an old chest for display but in the end I opted for a kaleidoscope of colour upon rods and an (accidental) clothes horse, as greeting. It’s challenging to come up with ways to display felt scarves and wraps that doesn’t give too much of a shop feel, because you are stepping into my studio and not a shop after all. In 2013, the first year I opened my studio to the public I felt overwhelmed with the amount of visitors. This year the inclement weather may have kept people away but I enjoyed the slower pace and that I got a chance to ‘receive’ everyone who called in and chat and show and tell. I feel dismay when people walk in and out and I haven’t had a chance to even say hello and welcome. I’ve been asked whether it’s worthwhile and ‘was it a success’? I’d answer in the affirmative to both questions. Artists don’t just need the opportunity to make an income (which is one of the objectives of the Open Studios program) but they also need the social interaction with other people. We need to educate the public about what it is we make, how we make, and perhaps what calls us to making – only then will there be a greater appreciation of our contributions to the community. We’re often told to ‘get a real job’ and making is a real job, even though artists’ incomes don’t often reflect the ‘real’ or enable us to survive in the real world. Consequently, many of us continue to make, as a hobby. I don’t know what the answer is – as consumers, some of us don’t think twice about spending a couple of hundreds of dollars to have our hair done or invest in that new tech gadget but when it comes to buying something handmade or a work of art, we fluff around about it and in the end decide to head down to wherever it is we can get a bargain rather than invest in arts and crafts. Encountering this sort of attitude is tough and often depressing. I would like the consumer to think of one of my felted pieces as being an investment – something they may spend several hundreds of dollars to buy but will wear for the next decade or so, and if they grow tired of it, can pass down to someone else to enjoy. My felted garments and accessories are not made to be disposables, and if looked after properly, can endure for a long time. As a maker I invest in research and experimenting, which enables me to make good felt and ‘give felt a good name’. A hearty thank you is owed to Burrinja Cultural Centre for supporting the program and enabling artists in the Dandenong Ranges to interact with and educate the community ; ‘present’ who they are and what they do; and even on occasion, earn some bucks, all without having to leave their studios.